This conversation brings up two small matters worth nothing. First, the dog. He fears anything that can spin, as I have mentioned before. Though we all agree that Chief generally behaves well, he loses his composure around wheels and ceiling fans in a way that suggests deeply rooted canine emotional trauma caused by circular movement. Yesterday, a mere wheeled plank the size and shape of a shoebox top drove him to bark so furiously that I had to flip the object over and make the wheels face the sky in the manner of a dead or submissive animal. He approached cautiously, sniffed it, chewed on it a little and then chomped my hand in what I assume was a misdirected effort to injure the dolly more. It’s bizarre behavior. All attempts to teach him the value of wheels have failed. Once I heard him growl at a wheelbarrow. What’s perhaps of more widespread interest here is the word dolly. I’m sure I’m not the only person to confuse someone by talking about dollies and not meaning the ones that come with tiny hairbrushes and pink convertibles. dollies! all of them dollies! In fact, given that dollies (industrial sense) could be used by manly men who move heavy things, it’s funny they share their name with especially cisgendered toys for little girls. (Also funny: a little girl asking for a dolly for Christmas and receiving the wheeled one from literal-minded parents who wanted to teach her the virtue of specificity.) I could not think of a reason these two objects should share a name, so I looked the word up. 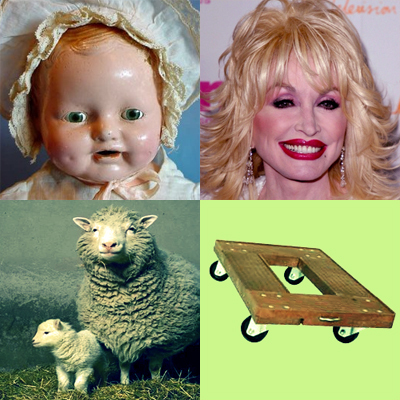 According to the Online Etymology Dictionary, dolly has been used since 1790 to refer to “a child’s doll” and was “applied from 1792 to any contrivance fancied to resemble a dolly in some sense, especially a small platform on rollers (1901).” That’s it. Okay, so maybe the turn-of-the-old-century version of “dolls” basically amounted to sticks and nails jammed into unripe potatoes, but I fail to see how even the saddest, most destitute child’s doll could ever look like the dolly I was using yesterday. I mean, I’d love to see a little girl dress up a platform on rollers like a Bratz and have a tea party with it. Who wouldn’t have a chuckle at that tragedy? But what’s the connection between a miniature humanoid toy and a wheeled platform? I can’t stretch my mind enough to see the latter as a dolly (toy sense) because it’s already a skateboard (crappy sense). I looked around online and discovered nothing conclusive about why these two objects share a name. I found some lousy theories — dolly (industrial sense) comes from doily because both go under something more important, that something resembling humanoid-looking dolly pin would have existed on a railway handcarts — but none of them seemed plausible. In fact, all I learned was that dolly (industrial sense) can also refer to a portable anvil, a vehicle trailer, a hand truck and about five other specific contraptions used to facilitate various forms of hard work. So I’m posting this then to both point out that the term’s history seems to be obscure (regardless of what Online Etymology Dictionary says) and to ask you to come forward if you can look at a simple wheeled platform and see a dolly (toy sense). And if you do possess such a liberal interpretation of the word dolly (toy sense), I’d also like to hear about the day your mud house finally got glass windows, the day you tricked Nellie Olsen into getting leaches on her legs, and the day your sister went blind and realized she’d never be a schoolteacher. Something like that would probably have been called a 'sheep dolly'. Anyway, I have no proof, only intuition, but that's what I instantly thought of. Well that actually makes some sense. But I'm still curious as to why the OED would fail to note that the definition of the term "dolly" could have been extended to refer to toys that wouldn't be considered traditional dolls. By the way, it's especially appropriate that the you you mentioned was a sheep on wheels, because a simply Google search for "dolly" will turn up many pages about Dolly the Cloned Sheep, who earned her name not from any connection with antique toys but because she was cloned form a mammary cell and that made her creators think of Dolly Parton. ha, yeah, part of the reason why I had such a hard time finding images was because of the fact that I kept getting links for Dolly the sheep. And like I said, I have only intuition, no proof. But if you look up 'sheep doll' or 'cat doll' or whatever you'll get hits for kids toys, even today. I think I'm onto something. Now I just have to persuade the OED to give me thousands of pounds to research it.